Apricot and cocoa combine perfectly in these amazing Cocoa Apricot Thumbprint cookies. 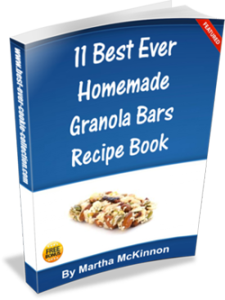 Perfect for the holidays or anytime you want to make a special homemade treat. This recipe calls for dried apricots which you should be able to find in the bulk section of your favorite grocery store. We personally prefer to use unsulphured apricots for the best apricot flavors. Apricots are classifed with plums and they have been grown in Armenia since ancient times. Apricot pits, or kernels, from the Mediterranean are very sweet and many people like to substitute them for almonds. Many people think that Amaretto and amaretti biscotti are flavored with almonds, but they both are actually flavored with apricot kernel extract. The oil that is pressed from these apricot kernels is commonly called 'Oil of Almond." Heat the chopped apricots, brandy and granulated sugar in a saucepan over medium-high heat, stirring constantly to dissolved the sugar. Bring to a boil, then reduce heat and simmer for 15 minutes until slightly thickened. Remove from heat and transfer to a bowl and hold at room temperature until needed. Toast the sliced almonds on a baking sheet in preheated oven until golden brown, about 15 minutes. Remove almonds from oven and cool to room temperature. Chop almonds for 10 seconds in a food processor with metal blade, or by hand, set aside. Sift together the flour, cocoa powder and salt. In a mixing bowl beat butter, brown sugar and honey on medium for 2 minutes, until soft. Scrape down bowl and beat on high for 1 minute until smooth. Add the egg yolks and beat on medium until incorporated. Add the almond extract and beat for about 30 seconds. Slowly add the sifted dry mixture while beating on low, just until incorporated. Using level tablespoon-size portions, gently roll the dough to form balls. Dampen your hands when necessary to prevent the dough from sticking while rolling balls. In a small bowl, lightly whisk together the egg whites. Dip the balls, one at a time, in the egg whites and then roll in ground almonds to coat evenly. Place the dough balls on non-stick cookies sheets, placed about 2 inches apart. 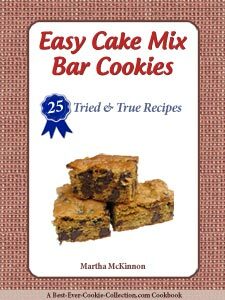 Using your thumb, or the back of a spoon, form shallow indentations in the center of each cookie. 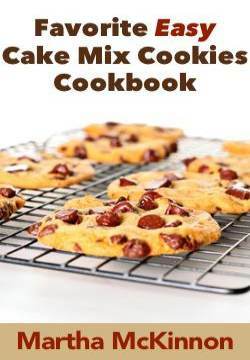 Bake for 10 to 12 minutes and rotate sheets 180 degrees halfway through baking time. Remove cookies from oven and immediately fill each indentation with 1 level teaspoon of apricot mixture. Cool cookies on the sheet for 1 to 2 minutes then transfer to wire racks to cool completely. 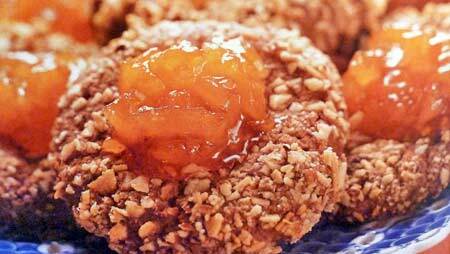 This recipe makes about 3 dozen Cocoa Apricot Thumbprint Cookies.